This rug is beautiful! Looks like the photos, a little lighter in the distressed areas. Matches everything perfectly. I would highly recommend. I purchased this rug for the end of my living room area for a round table where we gather to play games. I already have an area rug for the living room seating area. The colors in this new rug match perfectly with my other rug. The colors are very nice and this rug is very soft. It is exactly what I was looking for and at a great price. The compliments are galore and has very nice eye appeal. The only drawback is that it is not very thick and plush but it is perfect for my use. I recommend this rug. I absolutely love this rug! It’s vintage, sophisticated and elegant all rolled into one. 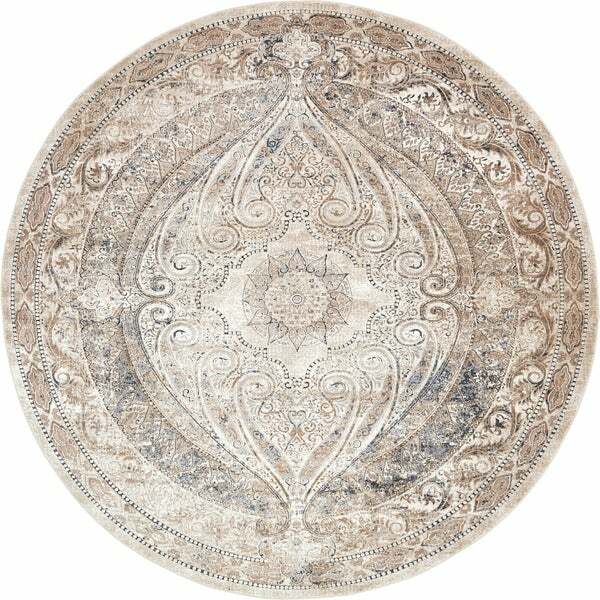 The shading provides the perfect look for this rug making it look as if it’s an antique. I purchased it in more than one size to fir both of my dining areas as well as my living area. It fits perfectly. Light weight rug. Low pile. Good quality with a lot of fade. It looks great in my house and I receive compliments all the time. Give the room an old world, high end style. Beautiful rug. Amazing and rich looking colors. Modern and sophisticated. LOVE LOVE LOVE and will recommend. Wonderful rug, just as pictured but had to return as it did not fit my space. Good carpet, the colors are pretty nice. First impressions are good but will submit an updated review after a few months of use. Nice pattern. Just as expected. Only thing is, it is pretty thin. Hoping it flattens out after awhile. "for the beige one, is the darkest part of the rug black or dark blue?"